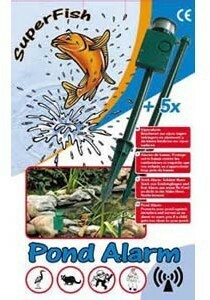 Details: SuperFish Pond Alarm protects your pond against intruders GB Ideal protection for your fish and children. Works against herons and cats, protects against theft of your valuable fish and keeps your children from getting too close to the pond. The Superfish Pond Alarm gives off a powerful acoustic alarm when uninvited visitors such as herons, cats, thieves or children approach your pond. It scares them off and you are altered. The acoustic alarm shuts off automatically after 20 seconds. The SuperFish Pond Alarm is also suitable as alarm or deterrent against intruders when camping, fishing, etc. The Superfish Pond Alarm is easy to install around a pond with a maximum circumference of 60 m. With the optionally obtainable set of 4 extra standards, you can protect a 100 m circumference. The Superfish Pond Alarm is watertight and works non-stop for approximately 14 months on the AA batteries provided. It comes with a full set of instructions. Contents: 6 standards, including 1 with alarm and 100 m nylon wire, 2 AA batteries.